Lene Hansen is Professor of International Relations, Department of Political Science, University of Copenhagen. She is the author of Security as Practice: Discourse Analysis and the Bosnian War and the co-author, with Barry Buzan, of The Evolution of International Security Studies. Lene Hansen has written on a range of topics including images and international security, cyber security, poststructuralist theory and methodology, gender and security, and the Danish debate on the European Union. 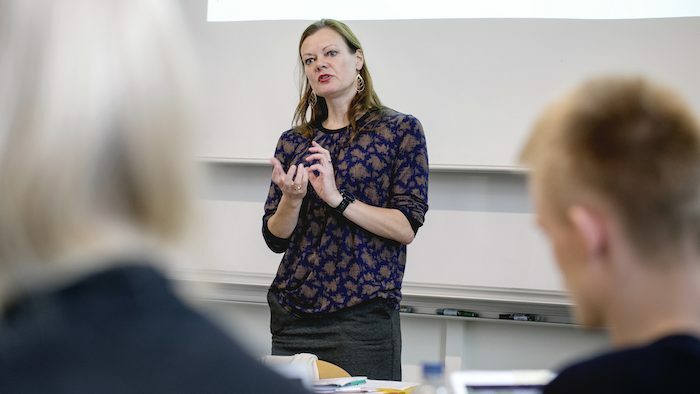 She is the director of two research projects funded by the Independent Research Fund Denmark, both on images and world politics: “Images and International Security” (2014-18) and “Bodies as Battleground: Gender Images and International Security” (2018-2022). Where do you see the most exciting debates happening in International Relations? There are quite a few, so it is not that easy to choose. For me, personally, the debate over why and how images and visuality matter has been an exciting one for the past few years. Theoretically, because it involves an engagement with the specifics of visual discourse compared to that of textual discourse. Methodologically, because it raises questions that cross the conventional distinction between quantitative and qualitative methods. On that note, I am also finding the debate over how to develop post-positivist methods in general an exciting one. That is hard to say, actually. A shift in thinking might allude to the rejection of a prior position, but also to turning to new questions and approaches. I’m not sure my thinking has undergone radical shifts, though it is hard to be the judge of one’s own work. In terms of turning to new issues, I would probably say that the Muhammad Cartoon Crisis in 2005-6 provided the starting point for addressing visual representations, their role in security politics in particular. In your Little Mermaid article, you critiqued the absence of gender in the Copenhagen School’s securitization theory. This work has now become the base from which many (feminist) works on gender, security, and/or silence depart. Do you believe that securitization scholarship has responded to your call to address this oversight? I think this depends on how broadly one defines securitization scholarship. Sometimes I am included within in the Copenhagen School, sometimes not. It also depends on how one reads the classical texts by the Copenhagen School. I have tried to advocate for a reading that emphasizes the instability of those texts, thereby also enabling a more poststructuralist understanding of securitization theory (in Security Dialogue, 2011 and Review of International Studies, 2012). This reading creates, in turn, a potential point of engagement between feminist poststructuralist work and that of securitization theory. Critical Security Studies has witnessed various ‘turns’ (ethnographic, practice, discursive, aesthetic, visual, corporeal, and material, to name a few). Do you think it is wise to talk about ‘turns’? Does this pigeonhole scholarship; what are the benefits? I understand those who find the turn-terminology overused. At the same time, sociologically speaking, “turns” provide a way to legitimise bringing (critical) scholarship into International Relations. Put differently, had there not been for example a practice turn or a linguistic turn in other fields of research, it would arguably have been harder for International Relations scholars to get work inspired by these turns accepted. Like paradigms and numbered debates, turns provide signposts and points of reference. They are sociologically significant at a general level. As such they might not be able to fully convey the complexity and multifaceted nature of scholarship at the individual level, neither of scholars nor of texts. Your landmark text Security as Practice addresses common critiques of discourse theory and outlines a rigorous methodological programme for the completion of discourse analysis. Do you feel that poststructural and discourse-focused IR still has something to ‘prove’ to the ‘political scientists’? I think the main challenge here is perhaps less whether to ‘prove’ something or not, than what each of us reads, and can read, given how much is being published and other demands on everyone’s time. Based on who and where Security as Practice has been cited, it seems to me that it has found a relatively broad readership, not just amongst those who would self-identify as poststructuralist. That might allow for a cautious optimism in terms of discursive and poststructuralist work having an established place in International Relations. That said, as the author of Security as Practice, I’m not in the right position to evaluate its contribution. With the advent of social media and its use by political actors, the media, NGOs et al; what, if any, implications does this have for traditional discourse analysis? Do you envision an increase in mixed method studies which combine discourse analysis and computer assisted content analysis? Texts – and images – are available and searchable in dramatically different ways today than they were in the mid-1990s when I worked on the Western debates on the Bosnian War for my PhD. This provides us with opportunities for working with larger bodies of texts and this makes different forms of computer assisted content analysis seem like a promising tool. Andrew Bennett spoke about this in the keynote at the annual Millennium conference in 2014 (reprinted in the special issue about methods and methodology in 2015), and I agree that there is scope for further exploring the relationship between discourse analysis and computer assisted content analysis. One crucial question that arises here is how to incorporate the qualitative conceptualization of meaning making that comes from poststructuralist discourse analysis – that the significance of words does not rely solely (or mostly) with how frequently they are used – with quantitative content analysis’ traditional coding of frequencies. Should we strive for one “mixed method”, or, as Roland Bleiker has suggested let multiple methods provide different kinds of knowledge co-existing side by side? Bleiker’s suggestion was made in the particular context of visual methodologies, but I think it has relevance for International Relations in general. What role do images play in IR? Images matter in a number of different ways: they might be securitized like the Muhammad Cartoons; they might be icons like The Hooded Man from Abu Ghraib or Napalm Girls that act as reference points in world politics; they might be constitutive of an event like the footage and photos of planes hitting the World Trade Center that are intertwined with “9/11” to such an extent that we cannot imagine the event without them. And images are part of the social environment that enable and constrain the way in which foreign policies can be argued: pictures of wars that show bodies maimed provide a different visual discourse than pictures with no traces of human beings. A lot of your work on images has focused on methodology and covers starkly different genres from photography to cartooning to comic books, what are some of the methodological challenges of studying (different types of) images? The visual turn evolves around the claim that there is a distinctiveness to images that sets them aside from textual representations. At the same time, as you say, “the” image covers a wide variety of genres. One challenge is thus the classical one of how to reconcile the need for general theory and methodology with the need for theory and methodologies that have sufficient specificity that they “work” at the analytical level. The squaring of this equation involves theoretical deliberation. It cannot in other words be solved at the level of methods itself. Another challenge is how to incorporate the temporality through which images are seen. That is, some image genre – like editorial cartooning – are meant to be a “quick read”, not to be pondered for hours and hours like some visual art works. A third challenge is not to use the distinctiveness of the visual to create a dichotomy between text and images, where text is transparent, stable and rational and so on and images are polysemic and emotional. What lies ahead for Images work at the University of Copenhagen and the field of International Relations more generally? What opportunities do you see for the visual turn? For my own part, I’m working on a book tentatively titled Images and International Security. In it I hope to expand on some of the ideas I have put into print in two previous articles on images and world politics (European Journal of International Relations, 2011 and Review of International Studies, 2015). A book allows for a different kind of engagement than articles do, though I’m not fully sure exactly what the structure will be yet. One of the issues I plan to look at is the visualization of cyber security and climate change. I wrote an article on cyber security together with Helen Nissenbaum quite some time ago now (International Studies Quarterly, 2009) and we suggested that cyber security was much harder to visualize than climate change. I’m curious to examine in more detail whether this is in fact the case, and also theoretically, to ponder whether at least some of the sectors – the cyber sector and the environmental one – laid out in securitization theory have a distinct visual “grammar” compared to that of textual discourse. I’m also the principal investigator on a larger project on gender, images and security, which will ask a series of questions related to the visibility/invisibility of gender security problems. This project is designed to include quantitative methods too, more specifically, a coding of a larger number of photographic images. As for the field of International Relations more generally, there is such a wide variety of theoretical and empirical issues currently on and on its way to the table, an important one is how the production and circulation of images relate to what is being seen and not seen. And what the political implications of such visibilities and invisibilities are. Focus on quality over quantity in terms of your publications. It is easy to stress over how much one has got on one’s CV, but there is so much being published today, and so many journals, that a few good articles will count for more than ten-not-so-good ones.